Time for a glass of Sherry. Perfect as a sundowner snack. Preheat oven to 220°C. Pour sunflower oil into a roasting tray and place in oven for five minutes or until piping hot. Remove from oven, add the cubed potatoes and toss to coat. Return to the oven and roast for 25 minutes or until cooked, golden and crispy. Remove from the oven and place onto a small platter, season with salt and pepper and serve with the Napoli tomato sauce. Rinse squid well under cold running water to remove any grit or sand. Pat dry using some kitchen paper. Slice squid into rings and place in a glass bowl together with the tentacles. Dust well with flour and set aside. Heat oil in a heavy based pot until hot and gently deep-fry dusted squid for 1-2 minutes or until golden brown and crispy. Remove from oil using a slotted spoon and place on absorbent paper to soak up any excess oil. Season squid with salt, chilli flakes and lemon zest and serve immediately with lemon wedges. Heat oil in a frying pan and gently sauté onions and garlic for a few minutes until golden brown. Add chorizo and continue to fry until slightly crispy. Pour in wine and allow to simmer for 5-10 minutes or until most of the wine has evapourated and chorizo is lightly coated. Toss in chopped parsley and serve immediately. 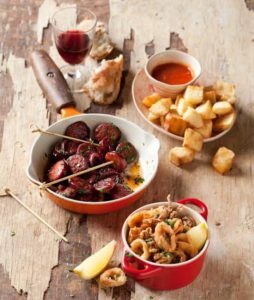 Tapas having originated in Spain makes Sherry a classic pairing – bone-dry manzanilla better suited to the squid while richer while more nutty fino will go well with the chorizo. A crisp and lively bubbly is also an option.